Here I have collected together interesting examples of mediaeval herbal manuscripts and related documents which might help us to understand the Voynich plants better. My aim is to offer a respoitory to help everyone to find them and comment on them. If you know any, and you want me to include them, please add a comment on this page. "This herbal was begun in the first half of the 15th century and continued for about half a century. It presents an interesting contrast between the early, conventional representation of plants and the naturalistic style, which was becoming common by the end of the century. Eastern Mediterranean, Greek cursive, 15th c, The Herbal of Dioscorides Pedanius, Isocrates and Galen], in Greek. Illustrated Manuscript on Paper. Written in the Eastern Mediterranean in the fifteenth century. Hunayn ibn Ishaq was the Syriac translator who translated many Greek works into Syriac and Arabic, including Galen's 'Hidden Drugs', with his commentary. This discusses a Hebrew version. Not a full herbal, but an interesting discussion about a Hebrew version of Galen's original Greek text, with commentary by Hunayn ibn Ishaq. Part 2 mentions hellebore as 'kharbaq'. For example see 'Kharshaf', artichoke, at the bottom of folio 174r: here, last picture on the page. It would be interesting to compare the paints used in the Florentine Codex, with VM. There is also another recent study at the University of Alberta in Canada of the VM by Kondrak a linguist, and Hauer a computer expert, who used AI to decode the manuscript, using computers trained with an algorithm. They discovered that there are many Hebrew words in the manuscript (80%). They said that the book is mostly about women taking baths to heal sickness. What is interesting is that another scientist has discovered that Nahuatl language has many Hebrew words in it! Brian Stubbs has made a linguistic study of both Middle Eastern languages and Central American languages, and come up with one that used Hebrew words. That is Uto-Aztecan or Nahuatl. So, there may be a connection between the early 16th century Mexican writings and the VM. Here is the article for those who are interested. Is it possible that the thirteenth tribe of Israel landed in the New World, and shared their knowledge with the Indians (as the book of Mormon states)? Is the Voynich Manuscript the 13th codex of the Florentine Codex? Very intriguing possibilities here! There is DNA evidence that Jewish people were exiled to America. Here is some possible linguistic evidence. It makes sense that researchers were not able to find the source of VM in Europe, because they were looking in the wrong place. The VM may have connections with Europeans, who were working in America, and bringing back vital new information. Florence Riccardiana ms 2174 is a XV Century (after 1463) Florentine herbal, apparently connected with the so called “alchemical herbals”. The illustrations are less schematic than in other exemplars of that tradition. 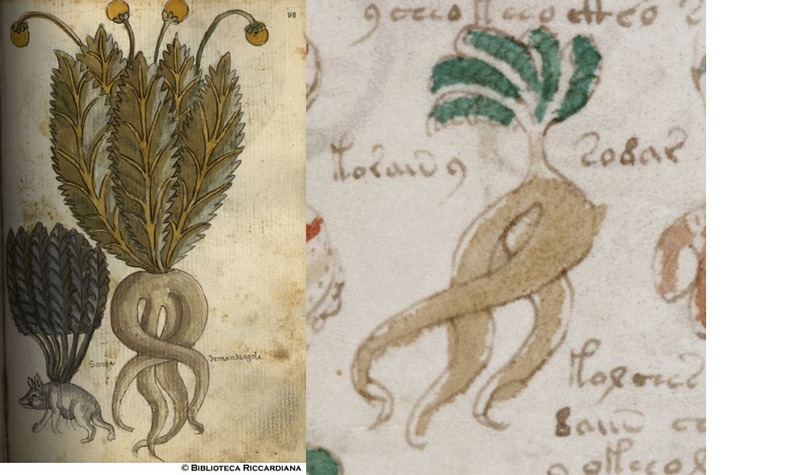 The attached image compares Ricc.2174 f96r (“scorza di mandragola”) with one of the plants in Voynich f89r2. 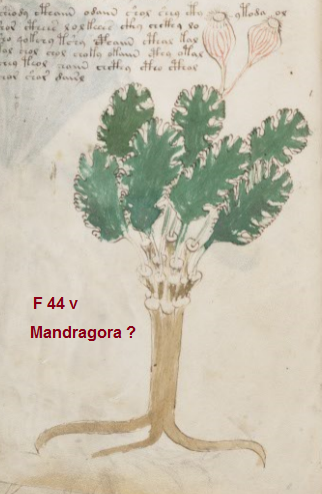 Personally, I think F44v could also be the Mandragola. The similarity speaks for itself. Now that you’re talking about it, somewhere I’ve read something about this theory. The possibility exists, however, if I miss the important medicinal plants where I miss in the VM. Unfortunately not all pages are available online, unless anyone know’s differently? 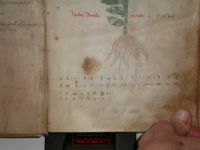 Its a manuscript copy of the Hortus Sanitatis its dated to 1489. I’m unclear if its a copy from an earlier printed book (it was first published in 1485) or if it represents an earlier tradition. The herbal/animal section contains what I think are some of the roughest plant drawings I’ve seen in a medieval manuscript – much more like the VM depictions than most examples. I think the VM also contains similar thematic divisions – the VM Zodiac section, has perhaps closest parallels with the Lapidary of Alfonso X the Wise [ms. H. I. 15 › Real Biblioteca del Monasterio (San Lorenzo de El Escorial, Spain)]. The VM Zodiac section may therefore represent illustrations originally accompanying a section on Lapidary (and its relation to astrology or medicine). The bathing section, I believe is more likely to be a treatise on urine (which would explain the bodily organs that are shown). Some of the animal drawings are also worth a look – the elephant and the way some of the smaller animals are simply drawn, share parallels with the VM. I am trying to locate pages about Viburnums in old manuscript herbals. This page is wonderful—but is there a way, here, or on other sites, or is there a human source that could help me since I don’t speak the various languages. Here’s a German Herbal manuscript (Kräuterbuch) dating from 1462 (or possibly earlier) and originating from Northern Bavaria. Its reference is Kräuterbuch, Staatsbibliothek Berlin, MS. germ. qu. 2021. It was written by Johannes Hartlieb (c. 1410 – 18 May 1468), a physician of Late Medieval Bavaria. He seems to have been an archetypal Renaissance man : he wrote a “Compendium on Herbs” in c1440, and in 1456 the “Buch aller Verpoten Kunst, Ungelaubens und Der Zaubrey” (Book on all Forbidden Arts, Superstition and Sorcery) on the Artes Magicae, containing the oldest known description of Witches’ Flying Ointment. Hartlieb also produced German translations of various classical authors (Trotula, Macrobius, Gilbertinus, Muscio). 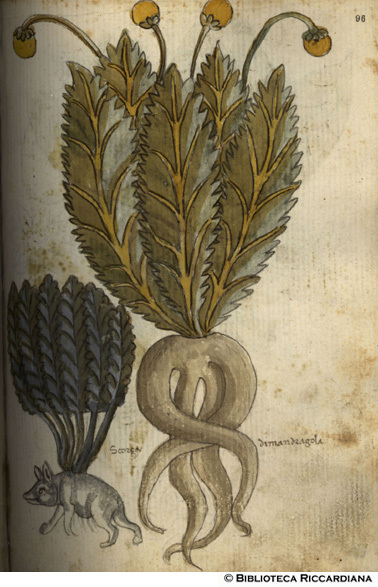 The herbal manuscript can be viewed here. Johann Hartlieb’s Kräuterbuch (Book of Herbs), dating from the middle of the 15th century, is basically an extract of Konrad von Megenberg’s Buch der Natur (Book of Nature) that was written one century earlier. The main subject of the text are plants – mostly herbs – and their medical use. What makes the Kräuterbuch special is the side-by-side presentation of text and images. The high costs of such a richly decorated book makes it highly unlikely that it was actually used by doctors or pharmacists of the time. Furthermore, the botanical imprecision of the 160 pictures would make an identification of a specific plant in nature difficult, not to speak of the ten animals whose images were added. Hartlieb’s work was obviously created for representational purposes, he himself being the long time personal physician of Duke Albrecht III. of Bayern-München. I attach a few sample images below. I located another 15th-century Kräuterbuch, [Staatsbibliothek Berlin MS Germ. 515]; it only contains plant descriptions without illustrations. Its incomplete – containing only plants from Arthemisia to Crocus. And here is another image from Kräuterbuch, Staatsbibliothek Berlin, MS. germ. qu. 2021. [1440/1468; Bavaria] by Johannes Hartlieb showing the layout of plant images and the accompanying text. Another interesting German herbal is known as ‘Auslasser’. I have now read “Il giardino magico degli alchimisti” by Segre Rutz Vera. It discusses the “alchemical herbals” tradition and in particular the manuscript now in Pavia, Biblioteca Universitaria MS Aldini 211. 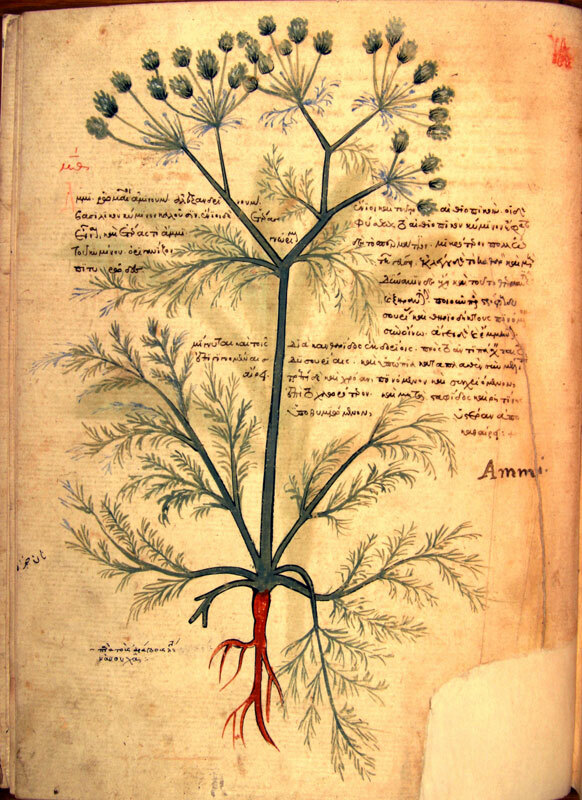 About alchemical herbals, see this web page by Philip Neal. There are some excellent discussions of the related subject of color annotations available on line: this web page by Rene Zandbergen (see also Rene’s post here); this post by Nick Pelling. Segre notices that almost half of the 98 plants in the Pavia herbal could not be identified with certainty (and we are speaking of an herbal written in plain Latin!). In particular, 13 plant names seem to be corruptions of known names (e.g. “Antolla” for “Anthyllis”, “Ariola” for “Oriola”). 23 plant names possibly are badly corrupted (e.g. 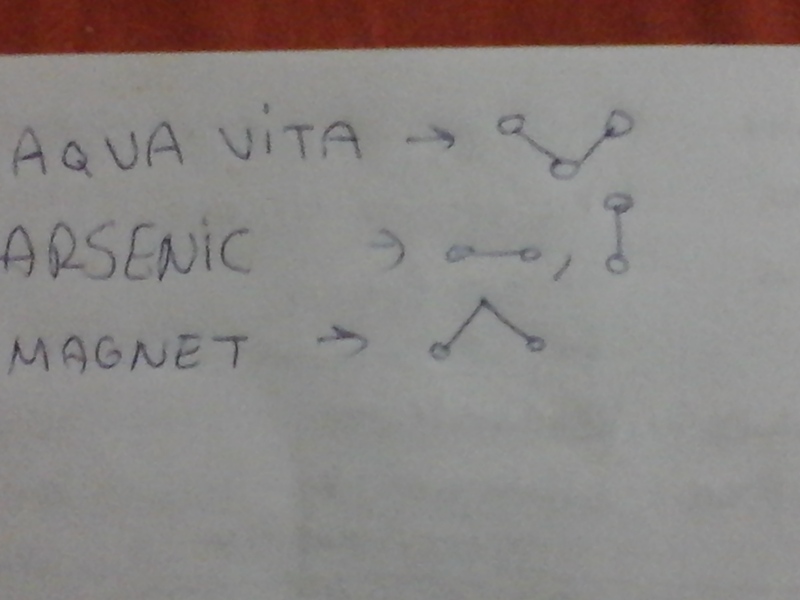 “Metries” for “Myrtus”, “Rigogola” for “Galega”). 10 plant names could not be related to any known plant names. Another interesting thing I found in Segre’s book is that, even if the oldest existent alchemical herbals were written in Latin in Italy, the tradition later spread to other languages: Italian (rather obviously), German and Hebrew. One of the German manuscript translates the text back from Italian to Latin (obviously introducing numberless errors). Rene discusses an alchemical herbal written in Latin, but with German color annotations (Vicenza, Biblioteca Bertoliana MS 362). Segre deducts from this detail that the manuscript was created in a German speaking country. Rene discusses the color annotation “rot” in f4r: the analogy with the “rot” annotation in MS 362 seems to me the strongest evidence for the place of origin of the Voynich manuscript. Both the Hebrew herbals discussed by Segre are now in Paris. Ms Latin 17844 was written in Latin, but the plant names have been translated into Hebrew. Color annotations are written in Hebrew as well. Manuscript Hébreu 1199 (to access images, search 1199 in this page) was entirely translated into Hebrew. I attach an image of f37v. According to Segre, both manuscripts were produced in Italy in the XV Century. 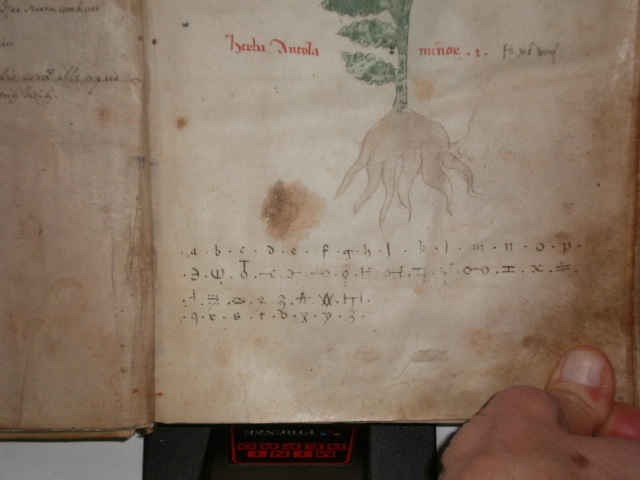 It has other things in common with the Voynich MS, and it was once owned by the French physician and botanist Jean Ruel. Ruel lived in the area matching the dialect of the month names in the Voynich MS. Something worth following up, and the least it shows us is that it is entirely possible for a 15th C North Italian herbal to spend some time in N. France, and then end up in Florence. What I really wanted to say, however, is something more problematic. The text of the alchemical herbals are like ‘recipes’ and their length is not that different from the text on the herbal pages of the Voynich MS. They also vary in a similar way. In some MSs they are written near the drawings, and in others they are collected together on dedicated pages. These recipes, however, are full of standard phrases that repeat many times, from one herb to the next. 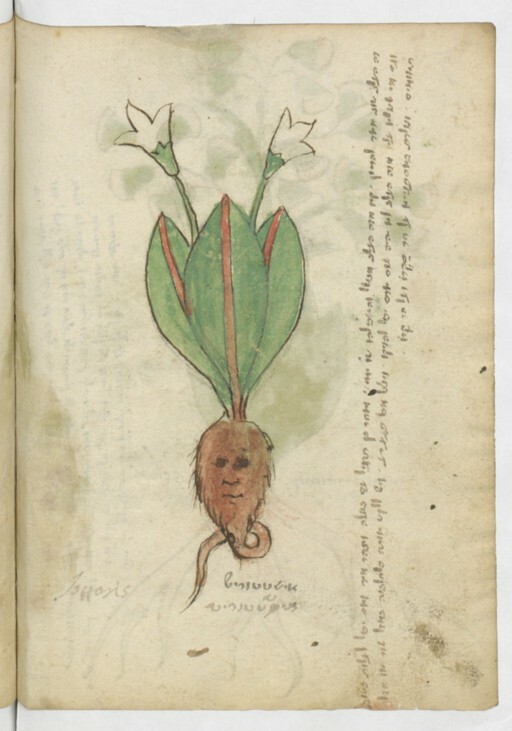 This we do not see *at all* in the Voynich MS, and it is in fact hard to imagine how the Voynich MS herbal text can be considered herbal recipes…. Hello Rene, the cipher alphabet in Florence MS 106 is also mentioned by Segre Rutz. Obviously, I was curious to see it. A few weeks ago, I browsed through Ragazzini’s book in search for it, but I could not find it. Do you please have an image of that page? Is it actually reproduced in Ragazzini’s book and I was too hasty to see it? 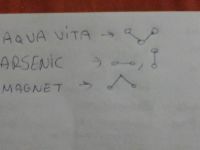 the alphabet was just cut off in the illustration of Ragazzini, but I attach an image below. I also showed this in the Mondragone in 2012. Rafal Prinke immediately recognised this cipher alphabet, but I could not find its name just now. One other thing about the Florence MS is that almost every page has later annotations that start with ‘fo’ (for folio), and a similar one is found on the Voynich MS f2v just above the first word in the second paragraph. It allows for a lot of speculation….. Thank you Rene! It looks similar to the Fontana alphabet discussed by Stephen one year ago… similar but different. Very interesting! I’m not sure that the idea of the MS’ botanical imagery being a “herbal” isn’t a circular argument: I mean they are assumed to be from the “herbal” tradition of Europe only because so much is assumed about the origin of the manuscript, and Latin Europe had only that one tradition. Of interest (for that reason) St. Gallen, Stiftsbibliothek, Cod. Sang. 44 which is not a herbal, but (to quote the holding library) ” a “compendium of 27 medical and pharmaceutical treatises by known and unknown authors of the 9th century”. It was copied for, or perhaps in, the monastery of St.Gall but it is interesting not least because so many of the ingredients are not western, but eastern species. And (as I have pointed out in a very recent post – October 16th., 2015) all our accounts (chiefly written in Arabic) agree that the only people bringing such things into Europe at the time were Radhanites, classed by the Islamic writers as Jews. I should be very cautious about assuming that all Jewish texts derive from Latin ones, or indeed from making the complementary assumption. The western herbal genre, itself, is acknowledged as deriving from earlier traditions of the eastern Mediterranean – mainly Egypt and southern Asia minor. Earlier, I mean, even than the Islamic conquests. I wrote on this topic, and referred to Riddle’s seminal article analysing the recipes in that manuscript, in January 2013. Riddle’s one mistake (common in his time) was to assume that ‘Arabs’ conducted the trade, but the Arab writers of the time themselves say that none but the Radhanites knew the routes across the range from France to China, whether through modern Switzerland, Germany, Poland and Ukraine etc., or through Syria and Iraq, or Egypt and Arabia, to India, south-east Asia and (perhaps) southern China. I might also point out that to provenance a physical object is an entirely different matter from provenancing the matter it contains. This is too often forgotten by people interested in MS Beinecke 408. A copy of the Psalter made in England does not make the book of Psalms an expression of English native culture. The same is true of a book translated from Italian into Spanish or (as with MS Beinecke 408) even if one could be persuaded to accept a manufacture in Germany etc., it is not sufficient basis to classify the content – especially when there is nothing about the style of drawing, nor much in the content to support that idea. As for the written part of the text… I can’t recall any analysis ever done which came up with a result suggesting German – can you? 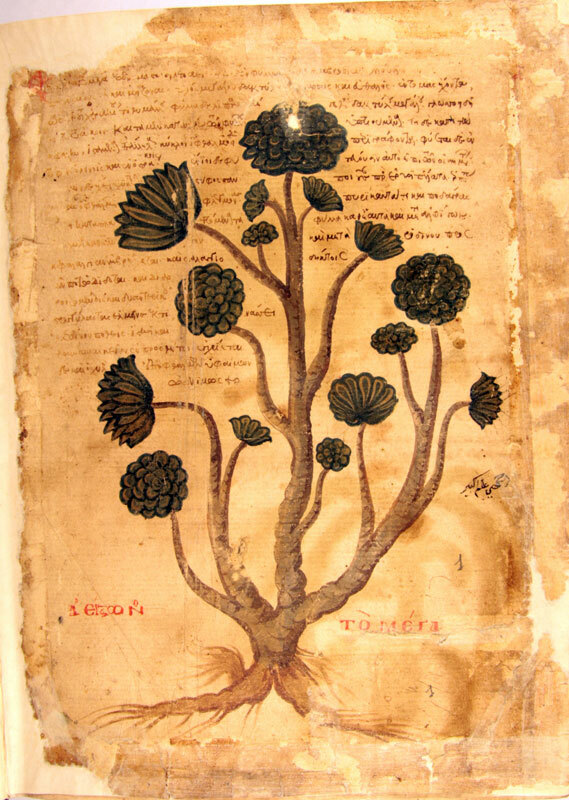 Here’s an image from a mid-14th century Byzantine herbal manuscript from Constantinople. More images from this Byzantine herbal manuscript (Biblioteca del Seminario, Padua. M.S.194), dating from 1351-1376, can be found here. Many pages contain text that envelopes the accompanying plant drawing, a feature that also occurs in the VM (eg. on f1v, f2r, f2v, f8v etc.) 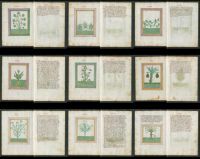 rather than having a block or blocks of text that accompany an image, which is often the case in other herbal manuscripts. Thanks Ellie – fabulous. If you don’t mind I will add them to my list when I have a moment. 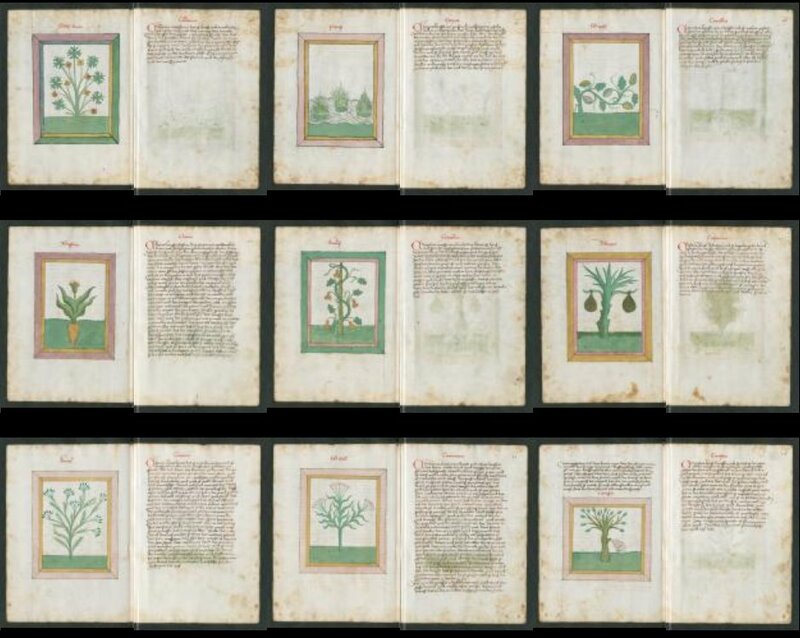 To me it’s very instructive to see that many images of the Voynich ms that seem weird to modern eyes actually belong to a consolidated tradition in late medieval science. Yes, I agree totally with your last comment, and it is helpful to show, through looking at specific details like these, exactly how it does fit in. I would only add that these traditions spread beyond Europe to include Arabic and other cultures. Thank you for the new manuscript section, Stephen! I think it would also be interesting to collect relevant astrological manuscript. I agree! I’ll make one. Aqua Vitae: the Water of Life and / or Sol (the Sun) / Gold. According to many legends water of life in the Zulmet Country ( Country of Darkness). Another opinion it’s a plant that grown only depths of Red Sea. its name is “Galsam otu” or “Şah-ı Galsam”. in the story of prophet muhammad and moses its a water. according as Zülkareyn’s story (Alexander the great). in the story of Gilgameš its a plant. He found the pland but a snake took it and run away.